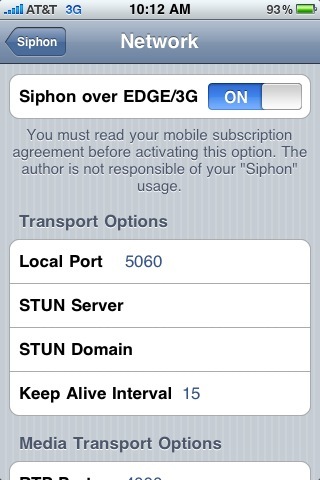 On September 17th I wrote about how siphon, a SIP app for the iPhone was working over 3G for me in Los Angeles but not in Connecticut. Apparently, port 5060, the SIP port was blocked in Connecticut but not in Los Angeles. Sources have informed me that AT&T was trialing opening up port 5060 nationwide but was first opening it up in select cities, including Los Angeles. I guess I was onto the "big news" about AT&T now allowing VoIP over 3G calls and didn't know it. I just tried siphon again in Connecticut, which just a few weeks ago was not working, and whaddya know? It works! I was able to register an extension to my Asterisk-based IP-PBX and make an intercom call to my coworker. Quality was superb over the 3G data connection. I was also able to receive a call. Since my iPhone is jailbroken, I was able to set siphon to run in the background and receive inbound calls while checking my email. Sweet! 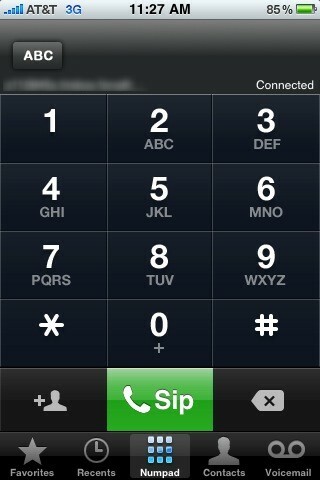 Being able to make and receive SIP calls on the iPhone is certainly a game changer. Of course, it isn't just SIP VoIP calls that work over 3G now. Before AT&T's announcement to allow VoIP over 3G, Skype was limited to just WiFi but now it too works over 3G. Allhough there were "hacks" to get around the WiFi limitation by using VoIPover3G or 3G Unrestrictor. I've been using these hacks for awhile to make Skype over 3G calls. Guess these hacks are no longer needed. Though Skype will have to release a new software update to allow VoIP over 3G calls. By default it tells you it isn't allowed. This also means all the other SIP-based applications in the Apple App Store will have to release new versions that remove the 3G restriction. It might take some time for your favorite VoIP app to be released that allows 3G data calls, but it is coming. So what does this mean for mobile VoIP? Well, AT&T has just opened the door for iPhone users to use inexpensive SIP termination service providers of their choice. Of course, most mobile phone users already have a free bucket (3500, 5000, etc.) of minutes, so this may not mean much to them. The big deal may only come into play when making expensive international calls. Then again, teenagers can use 3500 minutes in a week, so having a supplemental service (VoIP over 3G) that can help them avoid overage charges could be huge for the teenage demographic. Lastly, businesses will find it useful because now employees can have a single-number identity. Coworkers can just dial a fellow coworkers extension and it can ring their iPhone over 3G. No need to know the cell phone number, which the coworker may wish to keep private anyway. Although there are some complexities involved with having a desktop phone and an iPhone registering simultaneously with the same SIP credentials for an extension. Vonage solved the dual SIP-credentials dilemma, so I'm sure the IP-PBX manufacturers will figure it out as well. Outbound single-number identity works beautifully as well. Now employees can make calls using the CallerID of the corporation and not their iPhone's phone number, thus retaining the privacy of their cell number. 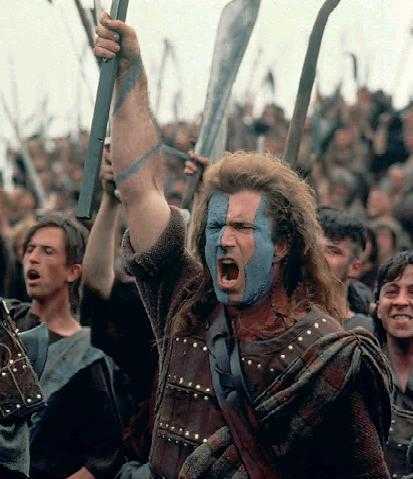 F R E E D O M !!!! Apparently, AT&T must read my blog or something, because once again SIP port 5060 is blocked. No more SIP calls using siphon. The AT&T Overlord giveth, and the AT&T Overlord taketh away. AT&T must do something now, its pretty annoying, getting blocked in middle of nowhere. Thank god, i quit using AT&T just a month back. Because i just got tired by waiting in order to getting problem solved. I recently moved to another PBX system provided by www.spiderstar.com, and i am quite happy now. At least i am not getting stuck in middle of something important. It's great to see this level of integration. These technologies are becoming so advanced, and yet they must understand each others languages. 3g will be fun to watch!